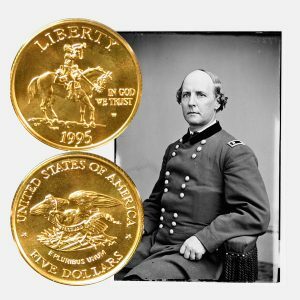 Today, the Civil War Commemorative Gold Five-Dollar Coin remembers Major General Hurlbut’s General Orders No. 4 on February 8, 1863, which attempted to suppress the media. General Hurlbut Squelches the Chicago Tory Organ. Matters at Memphis and Vicinity. Memphis, Feb. 9, via Cairo, Feb. 11,1863. The town was taken all by surprise, and the eyes of all secession sympathizers made to protrude some by the issuance of the following order by Gen. Hurlbut. General Orders No. 4. — The Chicago Times newspaper, published in the city of Chicago, having continued for a long period of time the publication of false and calumnious articles against the President of the United States, and giving aid and comfort to the public enemy, is hereby suppressed within this command. Said paper will not be allowed to be sold or circulated by news agents or others, and any news agent, captain of steamboat, or other persons who shall violate this order, will be arrested by military commission. All local Provost Marshals, officers of the army, and local citizens, arc charged with the execution of this order. This order will go into effect within this corps on the 12th day of February, 1863. By order of Maj. Gen. S. A. Hurlbut. As the Chicago Times has famished to the principal portion of the secesh residents of Memphis with dally mental pabulum, and as from its columns they realized all the aid and comfort they get from the North, the question now arises what they will do. Perhaps the organs of this city may endeavor to supply the deficiency, but if so, their proprietors will probably have sense enough to do it under the rose. Lake Providence. La., February 13, 1863. General : The steamers Rose Hamilton and Evansville are reported for violating my orders regulating trade. Not being at headquarters, I have not got access to orders to give you number and date of the order referred to, but it was published about the 20th of January, and prohibits boats landing at other than military ports, or under the protection of gunboats. Trade is not opened below Helena, and, therefore, vessels landing at all below there, except for Government, without special authority, are liable to seizure. I wish you would refer this matter to the provost- marshal for investigation. I have seen your General Orders, No. 4, February 8, prohibiting the circulation of the Chicago Times within your command. There, is no doubt but that paper, with several others published in the North, should have been suppressed long since by authority from Washington. As this has not been done, I doubt the propriety of suppressing its circulation in any one command. The paper would still find its way into the hands of the enemy, through other channels, and do all the mischief it is now doing. This course is also calculated to give the paper a notoriety evidently sought, and which probably would increase the sale of it. I would direct, therefore, that General Orders, No. 4, be revoked. Information which I have just received, and which is undoubted, shows that Van Dorn, with his force, went over to the Mobile road, to Okoloua. Price is at Grenada with 6,000 or 7,000 men only. North of that point there is no large force on the Mississippi Central Railroad. Our cavalry can go to the Tallahatchee without difficulty. The enemy have not got the road repaired yet north of Water Valley. I would like to have the road destroyed as much as possible south of Holly Springs. It seems to me that Grierson, with about 500 picked men, might succeed in making his way south, and cut the railroad east of Jackson, Miss. The undertaking would be a hazardous one, but it would pay well if carried out. I do not direct that this shall be done, but leave it for a volunteer enterprise. General Hamilton countermanded or suspended an order of mine directing the sale of some captured cotton. I wrote to him saying that the sale should proceed. I wish you would direct Captain Eddy, if he has not already done so, to proceed in accordance with my order in this matter. Over the next two years, other generals attempted to suppress what they decided were treasonous newspapers in the north. Ultimately, President Lincoln revoked any suppression of the press, whether for or against the rebellion. “But the grand cause — the only really guilty and formidable source of the dangers through which Illinois has passed — is to be found in the steady streams of political poison and arrant treason which have been permitted to flow from the wicked, reckless, and debauched newspaper press of the state. The Civil War Commemorative Gold Five-Dollar Coin shows with an image of Major General S. A. Hurlbut, circa 1860.